Enhance your homemade cards or your paper cutting projects by making your own homemade paper to use. Homemade paper is fast and easy to make, and can be made out of recycled paper and paper goods you already have lying around the home, making this an inexpensive and green project as well. Kids will enjoy learning the process and using their own paper for craft projects and greeting cards. Making your own homemade paper is simple. You can change the texture, color and finish of the paper depending on the ingredients and steps you take. 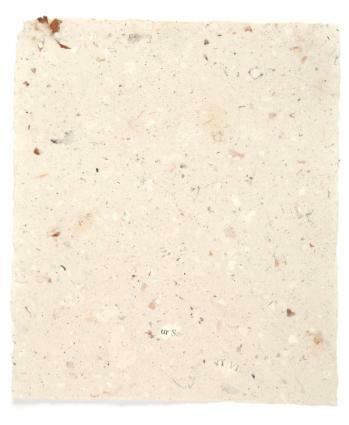 The first step to making homemade paper is to make your own paper pulp. This can be done by collecting paper and paper goods from around your home. Tear up the paper into roughly 1-inch squares. The lighter the paper, the larger the squares can be; heavier paper like cardboard should be torn into smaller squares. Place the ripped paper into a bowl or bucket of water and allow it to soak overnight. Take out the soaked paper by the handful and place it inside a blender. Add in two cups of water and blend for 15 seconds. Examine the pulp; if there are several large pieces of paper, blend again for 10 seconds. When the pulp is fairly uniform in size and texture, remove it from the blender. Don't worry if there are a few larger pieces; this will add character to the paper. Do not over blend; this could create weak paper. One blender full of pulp will create approximately one 8- by 10-inch sheet of paper. Once you have approximately 3 quarts of pulp, you can begin to make paper. Add 3 quarts of paper pulp to a 5 gallon bucket or dish pan and pour in water until it comes up to 3 inches from the top. Stir the pulp gently with a wooden spoon. You will need to stir the pulp before each sheet of paper you make. Wet down the mesh on the paper making mold. Hold the mold with both hands and dip it vertically into the bucket. Slowly turn the mold toward you inside the bucket so that it now lays horizontally, 2 inches below the surface of the water. Lift the mold straight up out of the water, still horizontal, and hold it above the bucket. Let the mold drain above the bucket for 10 to 15 seconds. Place the deckle on top of the mold and hold it in place with your thumbs. Push the mold and deckle back down into the water. Pull them up to the surface again and allow the water to drain while you gently shake the frames back and forth to disperse the fibers. Remove the deckle after approximately 30 seconds. Gently tip the mold on its side and leave it to dry in a warm, sunny area. The paper will be dry in a few hours. Use the tip of a knife to gently loosen and slide the paper free from the mold. Press the paper beneath a heavy book for a week so that it will stay flat. Once you've mastered the art of making your own paper, try some of these tricks to create unique sheets of art. Add dried and pressed flowers and leaves into your paper pulp before dipping the mold. The flowers and leaves will become part of the paper. Add some food coloring to the pulp to give your paper some color. Speed up your paper making process by getting two molds. While one is draining, you can dip the second, and by having two sheets drying at a time, you can double your production. The mold is basically a wooden frame with mesh stretched tightly across it. It holds the pulp in place while it is drying. The deckle is a second frame of the same size, without the mesh, that fits on top of the mesh and keeps the pulp on the mold. Elizabeth's Flowers: A basic kit used for making paper or drying flowers. Etsy: Kits here come in various sizes, and some make multiple pieces of paper at a time. The Paper Wright: Unique and multiple sizes of molds and deckles in a variety of wood species. If you'd prefer, you can also make your own mold and deckle. Set aside one of the picture frames to be the deckle. Measure the other frame and cut a piece of mesh of the same size and shape. Tack the mesh onto the frame. Start along one side and stretch the mesh tightly as you go so it is taut. Tap the tacks in firmly with the hammer. 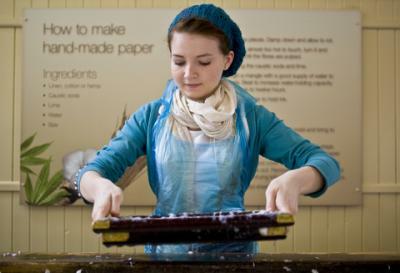 Learning how to make homemade paper can add new elements to your arts and crafts. Teach children to make paper they can bind into books, or create unique paper for your own personal stationary. You can use these one-of-a-kind pages for almost any paper craft project.